It is recorded in the Life of Pope John XXIII that when he was Apostolic Nuncio in Istanbul an old Armenian priest questioned him: "Excellency, what is the great sin against the Holy Spirit?" To which query the Archbishop replied, "Your Reverence tell me". "The division in the Church" was the old priest's answer. That incident has been reported as the origin of the Vatican II Council. At any rate we may safely say that Church unity has been the great desire of the 20th century pontiffs. It is also the reason for the foundation of Holy Annunciation Monastery - that Carmel be not the gift to, the possession of only the Western Church, but that the spirit of Teresa and John and the Carmelite charism be open to women of the Catholic East. The division of the Church means a divided Eucharist. Where does the Mother of God see her Son? The Real Presence is realized in both Catholic and Orthodox Divine Liturgies (Masses). The Church, the Body of Christ is not risen to full life, breathing with "both lungs"but is in the tomb of separation. 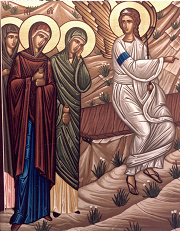 Like the Myrrhbearers, the Sisters of Holy Annunciation strive to be faithful in love, ministering to the Body of Christ in Truth and Charity, while remaining faithful to the apostolic community. Committed to a life of prayer, according to the tradition and lifestyle of Teresian Carmel, we hope for the day of Church Unity. These were - are - the motives and thoughts of the founding Sisters, Mother Marija of the Holy Spirit, Sister Marie Helen of the Cross and Sister Ann of the Trinity (d. 2001) when the Monastery was inaugurated on February 23, 1977. Divine providence had directed us to the Ruthenian people and their diocese of Passaic NJ, which stemmed from the Uzhgorod-Mukachevo eparchy in Transcarpathia (now Ukraine). At the time of founding Holy Annunciation, communism was in full force and daily we prayed for "our suffering brethren" (behind the iron curtain). As communism weaken and then collapsed (1989-1990), we received requests, even applications from young women in Byzantine Slovakia and Carpathia who felt they had a Carmelite vocation. Several Byzantine rite girls came to us from Slovakia and Carpathia. We in turn, promised, when feasible, that a foundation would be made in their homeland. This has been our endeavor since 1995 and in 2002 when we sent Sisters there to begin the Monastery of St. Therese in Koritnyani, Transcarpathia. In 1999 an unusual chain of events culminated in our accepting Sisters of the Syro-Malabar Rite from South India, now five in number and comprise one third of our community membership. As their presence has been a great enrichment, our gratitude is great. Bishop Dudick has encouraged our assisting a sister Catholic church of another Eastern Rite. 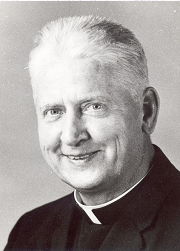 The place of Father Walter Ciszek, S.J. 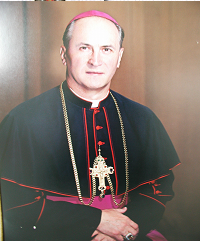 is central to our beginnings, both for the spiritual guidance and encouragement he gave to Mother Marija (and the first Sisters), but also because on his recommendation Bishop Michael accepted the Sisters - hitherto totally unknown to him- into his eparchy. © 2006. All photos by the Carmelite Nuns unless otherwise noted. or used in any form without permission of photographer.